Over the years, the sea wall at Tararu (just north of the old Thames North School) has often taken a hammering from the heavy seas that can hit the area. In the early years of the goldfield, this often meant that the tramway that ran from Thames to Tararu was damaged. The road narrow, with little room for repair. The walkway in those years known as O'Neill's Esplanade. The old papers have many examples of years when repairs urgently took place. In 1913 the Thames Borough Council hoped to have the problem solved and had three men engaged in filling the holes to the wall. Previously mentioned have been some of the early schools on the Thames Goldfields. I am in the process of gathering names from published prize-givings for private schools. These schools do not have surviving school rolls - at least not any located so far. Alarming to read how many children didn't attend school in 1882, when it was compulsory. So if your ancestor is missing from records found to-date, they may well have not attended a school. A newspaper report, December 1882 stated in the Thames Borough and County area that there were 2329 Children aged between 5 and 13 years who should be going to school. Results concluded nearly 600 children were not attending any school. Well great news for researchers with the magnificent Paperspast team getting the Thames Advertiser online. "Following the first major discovery of gold in the Thames area in August 1867, William Wilkinson and Claude Corlett decided to try their luck as newspaper proprietors in the embryonic Thames settlement. Born in Derbyshire, England, Wilkinson arrived in Auckland on the Nimroud in 1863. He joined the Southern Cross newspaper, acting as a ‘war correspondent’ during the New Zealand Wars, notably at the battle of Gate Pa, Tauranga, in late April 1864. Corlett, from Manchester in England, a compositor by training, also worked at the Southern Cross. The first issue of the tri-weekly Thames Advertiser and Miners’ News appeared in April 1868." You will find a wide variety of information and for the family historian no doubt BMD notices in particular that are not in the Thames/Evening Star. Remember more rolls and directories can be browsed at The Treasury in Thames, if you are passing through and able to visit. While updating the business registers for The Treasury at Thames, I came across what could be the first shops that were established in Fenton Street. Many of you that went to school at Thames South of my generation, will remember these shops in the 1960s. The rush to get there and get your ordered school lunch..maybe a filled roll plus an orange from the Grocer next door if you had a threepence/sixpence to spare. In 1895 Mrs Henry GRUBB is reported as having established a shop and Post Office Agency on land adjoining the Maori Meeting House. The bottom photo shows the location of the shop on the corner of Fenton and Heale Streets, known then as MRS GRUBB'S Post Office Store, Parawai. Below: The red arrow points to the location of Mrs Grubb's Parawai Store - on the corner of Fenton and Heale Streets. The Yellow arrow arrow indicating the site of the Meeting House. 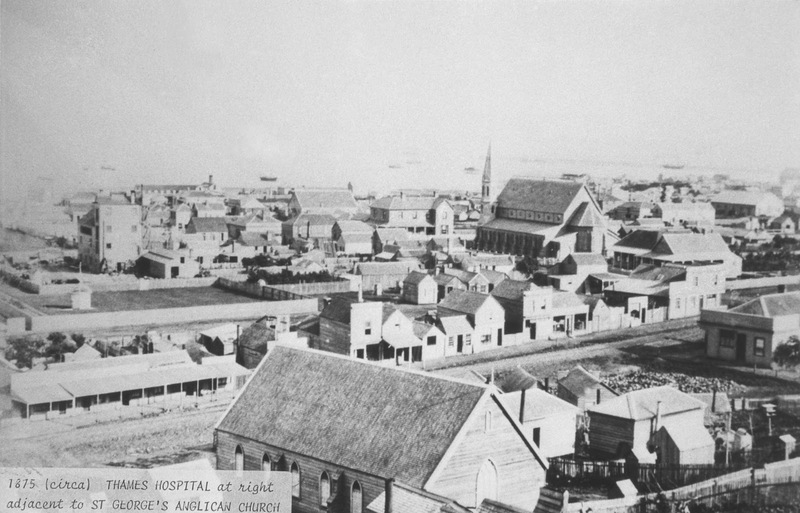 In this later photo it is being removed to the Auckland Museum, where it proudly stands today. Top right is the Thames South School. In April of 1895, a notice appears in the paper that D PEAT occupies Mrs GRUBB's old premises in Heale Street and that Mrs Grubb's is in the shop at the corner of Heale and Fenton Street. Raising the new dilemma to be explored...did Mrs Grubb move along the street? Major revamp of the Pre:1930 Business Register for Thames businesses is currently underway. These folders are held at The Treasury in Thames. Initially the goal was to collect an advertisement and photo of the shop - for businesses that operated in the first 50 year period. Now this is being refined to hopefully have: Start finish advertisement, special events and a bio/obit for the owner where possible. What is emerging is lots of names indicating changes of ownership and usage of shop/office buildings - this will allow for more detailed investigation of building usage somewhere down the track! Do you have ancestors that ran a business at the Thames - if so your information/photos would be appreciated. Whether it be one of the earliest to those post 1930 - contributions are always welcomed! 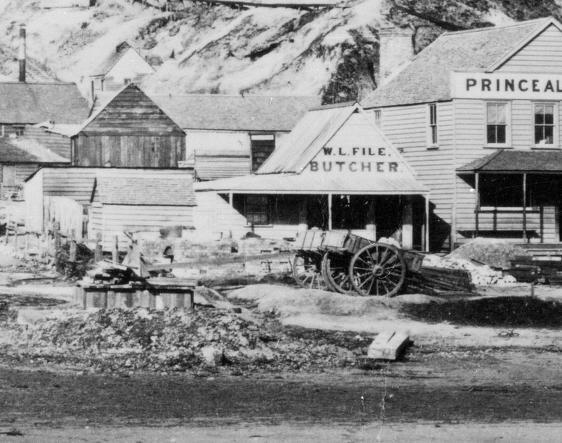 On the Kuranui Bay waterfront we have above a photo of Mr W L FILE'S butcher shop which he operated 1870-1872 . The previous owner was Mr John COOKE who established the business in 1867 and sold it to FILE c1869. With over a thousand shops found to date - one thing is for sure, there were a lot of families not just involved with mining in the town. While many went on to face bankruptcy, there are many who went on to have successful business ventures around New Zealand.